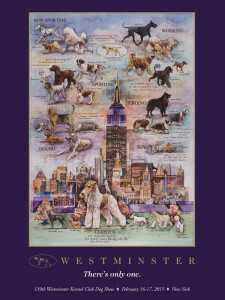 “I’ll Paint the Sky”, invoking the name of the 2014 Westminster Best In Show winner and also referring to the presence of the Manhattan skyline in the illustration, has been selected as the winning artwork for the 2015 Westminster Kennel Club Dog Show. It’s another spectacular pen, ink and watercolor image produced on paper by noted illustrator Chris Duke, whose works have represented Westminster previously in 2012 and 2014. Ms. Duke was also a finalist for the assignment in 2013. The winning image will be utilized in club materials to promote the 2015 show – the commemorative poster, the MSG tickets, the guidebook cover, note cards and more. As it has been every year since 2011, the contest was sponsored by the New York Academy of Art (www.nyaa.edu), which also selected five additional finalists. Ms. Duke is well known for her classical pen and ink style, in which she embellishes her art with geometric and textual elements that evoke the feel of a Leonardo da Vinci notebook. In this style, she depicts a range of subjects, including people, animals, flowers and architecture. Originally from Detroit, Ms. Duke was educated at The Parsons School of Design in New York and also holds a graduate degree in Figurative Studies from the New York Academy of Art. One of America’s premier illustrators, she has worked for many Fortune 500 companies including American Express, AT&T, IBM, and Adidas, as well as publications including the New York Times, People Magazine and the Wall Street Journal. She is also the official portrait artist for The Players Golf Championship. For more information about her and her work, log on to www.ChrisDukeArt.com. Co-organizer of the Poster Content, the New York Academy of Art is a not-for-profit graduate school that combines intensive technical training with active critical discourse. In the belief that rigorously trained artists are best able to realize their artistic vision, Academy students learn to master traditional methods and techniques and are encouraged to use these skills to make vital contemporary art. More information can be found at www.nyaa.edu. 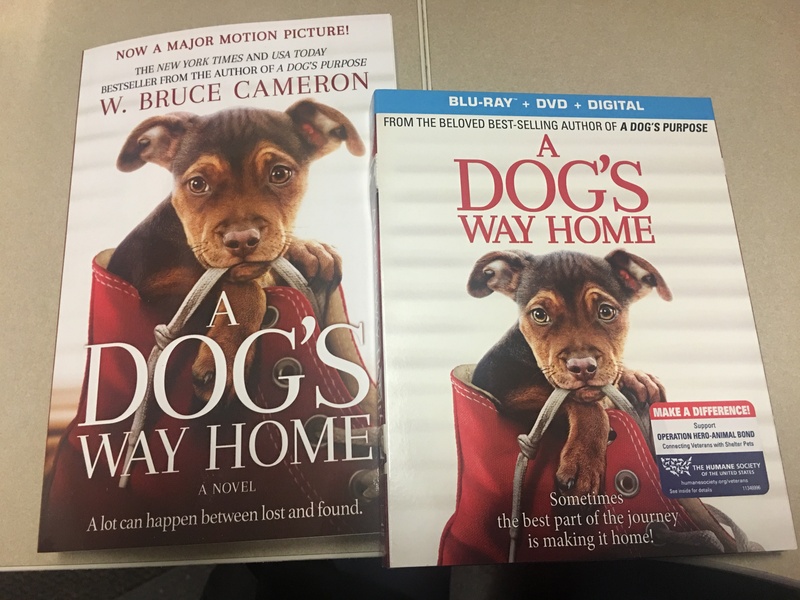 The charity recipient for poster sales proceeds in 2015 will be the AKC Humane Fund. They will also receive the original artwork. The AKC Humane Fund is committed to supporting the health and happiness of dogs across the country by protecting pets, supporting pet-related organizations and celebrating the human-animal bond. The AKC Humane Fund works to give back to dogs on a broad and sustainable scale through education, grant making and outreach promoting responsible pet ownership. The AKC Humane Fund is proud to be the leading organization providing financial assistance to domestic abuse shelters that accept pets. These grants make it easier for women’s shelters to welcome pets and help break the cycle of domestic abuse. The Fund is also dedicated to assisting rescue by providing financial assistance to not-for-profit canine rescue groups that are taking on significant, rescue-related expenses. Grants are used to help cover the costs of veterinary care, spaying and neutering, vital supplies and more. Visit www.akchumanefund.org to learn more, donate or apply for a grant. The Westminster Kennel Club and the New York Academy of Art thank their generous shipping sponsor, Cadogan Tate Fine Art (www.cadogantate.com).